Game of the Year 2017 Origins Award winner. It is a time of unrest in 1920s Europa. The ashes from the first great war still darken the snow. The capitalistic city-state known simply as �The Factory,� which fueled the war with heavily armored mechs, has closed its doors, drawing the attention of several nearby countries. 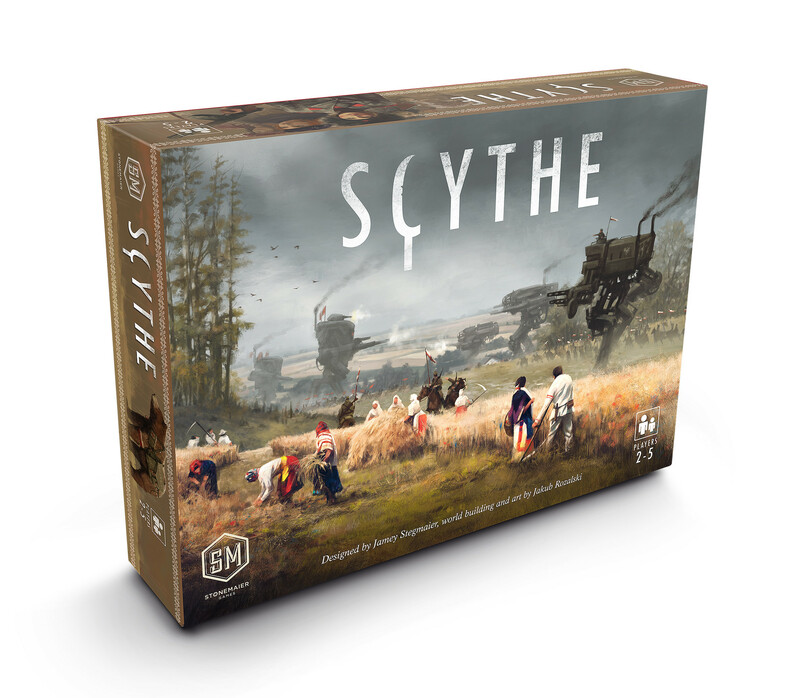 Scythe (1-5 players, 115 minutes) is a board game set in an alternate-history 1920s period. It is a time of farming and war, broken hearts and rusted gears, innovation and valor. Each player begins the game with different resources (strength, victory points, movement capabilities, and popularity), their choice of several faction-specific abilities, and a hidden goal. Starting positions are specially calibrated to contribute to each faction�s uniqueness and the asymmetrical nature of the game. Scythe gives players almost complete control over their fate. Other than each player�s individual hidden objective card, the only elements of luck are encounter cards that players will draw as they interact with the citizens of newly explored lands and combat cards that give you a temporary boost in combat. Combat is also driven by choices, not luck or randomness. Explore: In Scythe, characters are moving from their homeland onto a patch of land surrounding the mysterious Factory. The landscape itself is known�you can look across the horizon and see there�s a mountain there. What you don�t know is (a) the encounters you�ll have along the way and (b) what you�ll find when you get to the Factory. It�s in those elements of discovery that you are exploring in Scythe. Expand: In Scythe, players claim new territories with their units and buildings. At the end of the game, territory control is a big part of scoring. Exploit: In Scythe, players gather and use resources (food, metal, oil, and wood) and improve the efficiency of that usage through upgrades, building, and enlisting. Exterminate: In Scythe, players can use mechs and characters attack other players and eliminate opposing units from territories. It�s true that you�re not permanently killing units, though in any game it�s tough to kill an inanimate plastic token (maybe melt it?). It�s also true that Scythe is more often about the threat of combat than combat itself. A board game set in an alternate-history 1920s period. It is a time of farming and war, broken hearts and rusted gears, innovation and valor.